With all the dyno graphs we've accumilated for the air cooled Triumh twins, we thought we should put together a study of how the models compare to each other for power and torque in standard form and then at two identical stages of modification. 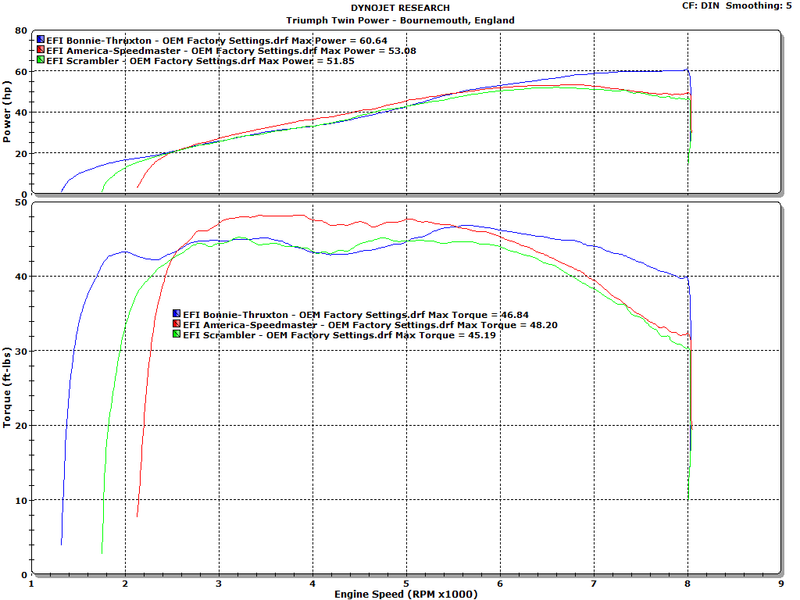 The first graph shows the standard bikes with no modifications, the second shows how the models compare when a TTP Stage 1 Torque Induction Kit and TORS were installed and finally the third shows all models with a TTP Stage 2 Power Induction Kit and short free flowing silencers installed. The initial dyno runs were carried out on standard non modified models with between 4 to 5000 miles on the clock. They were all serviced to ensure everything was set to spec and the SAI system was removed. Standard Dyno Run - No mods, standard airbox. Standard Dyno Run - Standard silencers. Stage 1 - Triumph Off Road Silencers (TORS). Stage 2 - Short Free Flowing Silencers. This graph shows the power & torque for each model as they come from the factory. The only modification being the removal of the SAI system (Secondary Air Induction) from each bike. This has no effect on power, but helps us with monitoring the fuelling accurately. The Bonneville/T100 and Thruxton give a simliar torque curve to the Scrambler up to 5000rpm, but a weaker curve than the cruiser models. They suffer from a torque dip between 3500rpm and 5500rpm, but after 5500rpm the Bonneville/T100 and Thruxton have a much stronger top end compared to the other models. The dyno graph shows that the America/Speedmaster give great low-mid range performance as you would expect from a cruiser motorcycle. The torque curve has a small dip between 3800rpm and 5000 rpm and starts to fall off after 5500rpm, the engine gives peak power at around 6800rpm. The Scrambler has a similar torque curve to the Bonneville/T100 and Thruxton up to 5000rpm, but then they pull away from the Scrambler. The Scrambler produces peak power at around 6500rpm. The stage 1 graph shows the power & torque from each model after stage 1 modifications have been carried out and TORS installed. 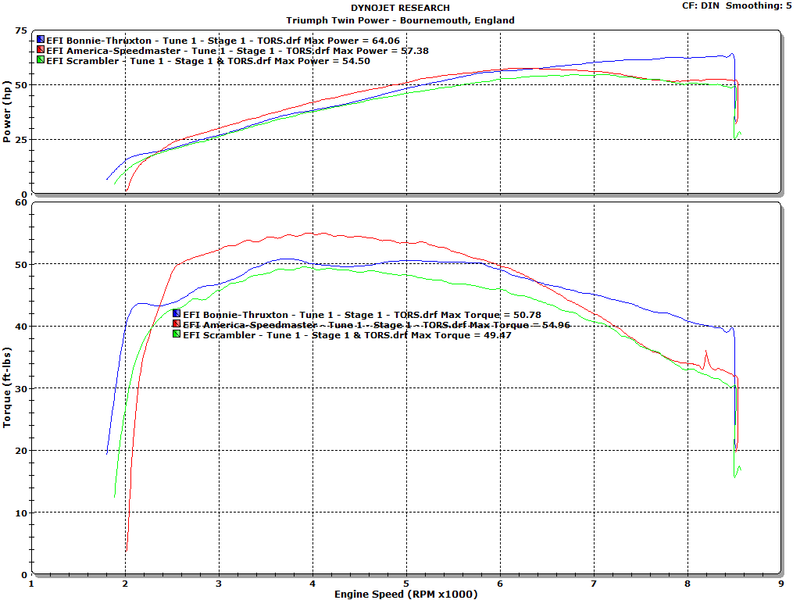 The Bonneville/T100 and Thruxton benefit greatly from stage 1 mods. The mid range has not only been boosted by just under 9%, but the torque hole between 3500rpm and 5500rpm of the standard model has been filled to give virtually flat torque between 3400rpm to 5800rpm. Peak power has moved up to around 8400rpm. The Scrambler has achieved good improvements to the mid range with peak torque occuring at 3800rpm. Peak power has moved further up the rev range with it now happening at around 7200rpm. Stage 2 involves removal of the airbox and pod filters fitted to each throttle body for more airflow. We have used short free flowing silencers with the stage 2 mods. With stage 2 mods and short free flowing silencers the Bonneville and Thruxton keep the top spot, giving an increase of over 14% in top end power. Although you get a nice increase in torque from 5500rpm to the red line, an amount of mid range torque is lost compared to stage 1. 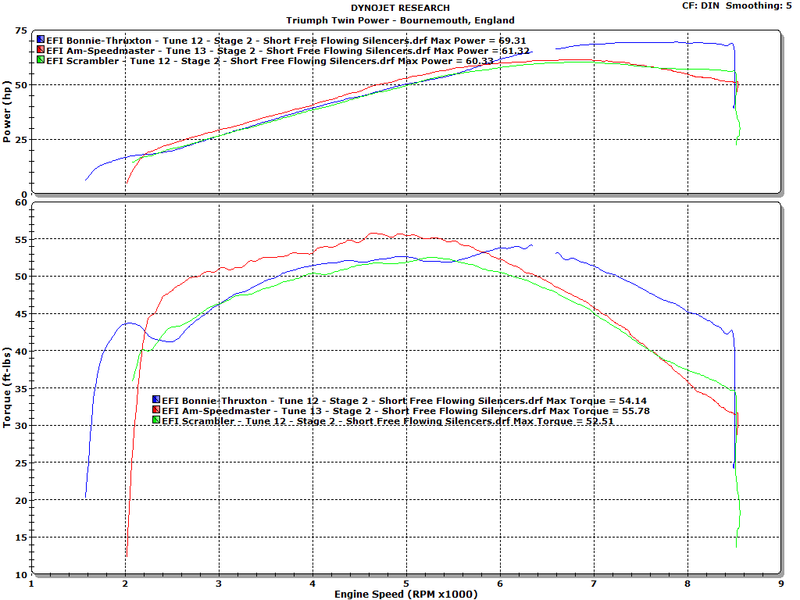 The America/Speedmaster benefit slightly in peak torque by roughly 1ftlb from stage 2, but overall the torque curve doesn't stretch across the rev range as it does with stage 1 mods. 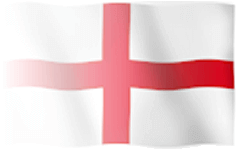 Please refer to our America & Speedmaster Induction & Exhaust Modifications page for the full round up. The Scrambler does increase the mid range torque with stage 2 mods, but only in the mid range between 4-6000 rpm. Again, please read the Scrambler Induction & Exhaust Modifications page for a full round up. N.B Please note the figures above are mainly peak figures, please look at the relevant dyno graph to see where you gain and lose power and torque! The Bonneville and Thruxton both give good top end power with the power increasing as you remove airflow restriction on the induction system. The America and Speedmaster give great low to mid range torque and again the top end is increased with the airbox restriction removed. As has been shown in the other sections of the X-Files, the mid range is increased when the airbox is modified for more airflow, but remove the airbox and install pod filters and you lose the mid range gains and gain an increase in top end power.